Calls for a statue honouring the late Gwynfor Evans have a sparked a row over its possible site in Carmarthen. An appeal has been launched to raise money for the monument to Plaid Cymru's first MP and committed pacifist, with a suggestion it is put in Nott Square. But that could mean moving the existing statue of Sir William Nott, arguably the town's most famous soldier. Nott Square was the scene of Mr Evans' 1974 General Election victory and it is claimed few people know who Nott was. 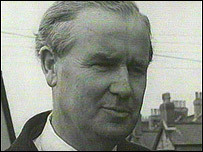 Mr Evans, Plaid president from 1945 to 1981, died in April aged 92. The statue appeal has been launched by the bi-monthly Welsh affairs magazine Cambria. Editor and publisher Henry Jones-Davies has asked readers for their suggestions as to where it should be sited and said that, to date, Carmarthen was by far the most favoured location. He said he would like to see the statue replace that of General Nott and the square re-named. General Nott, a military hero of the Afghan campaign of 1842, was buried at St Peter's Church in Carmarthen following his death two years later. In his July/August editorial Mr Jones-Davies said: "The statue of General Nott in Nott Square is a wholly inappropriate symbol of the new Wales, remembering, as it does, a footnote from a largely discredited imperial past. "The square itself was the scene of Gwynfor's historic victory in 1974 where packed crowds witnessed the momentous event. 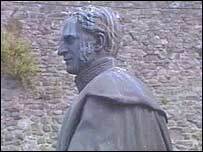 "What more appropriate location for a statue of Gwynfor and at the same time an official renaming of 'Sgwâr Gwynfor'. "Nott's statue could be elegantly relocated to St Peter's Churchyard or similar site, or simply given a position of dignified prominence in the County Museum in Abergwili." But the Reverend Towyn Jones, president of Carmarthenshire Antiquarian Society, strongly disagreed. "The statue itself is notable because it is the work of Edward Davies of Carmarthen, whose father was physician to Queen Victoria," he explained. "Queen Victoria contributed £200 herself towards casting the statue. 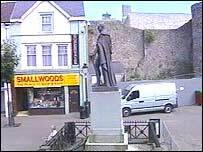 "Nott was the most famous soldier to be connected with Carmarthen and was a much better man than General Picton who is also commemorated here. "I don't think people in Carmarthen would be happy with the removal of something that is very familiar to them." He said he would prefer to see a statue to Mr Evans at the new market which is under development. "There are new developments happening in Carmarthen and Gwynfor belongs to the new chapter," he added.